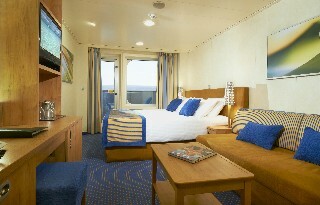 Carnival’s newest “Fun Ship,” Carnival Breeze, will debut in June 2012 with Caribbean-inspired interiors and staterooms. Expect island-inspired design, a combination of bright colors and soothing pastel hues, and images of palm trees and other tropical elements adorning hallway corridors. Carnival Cruise Lines’ private label draught beer that debuted in Carnival Magic’s Caribbean-themed RedFrog Pub -- has proven to be such a hit that it’s being rolled out to other ships in the fleet. Carnival, which launched its Facebook page in 2007, has become the first cruise brand to corral one million fans (www.facebook.com/carnival). Editor Susan J. Young sailed on a press trip on the Carnival Fantasy from Charleston, SC, in 2010. 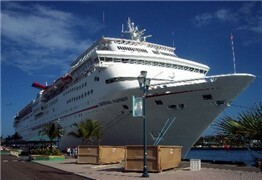 Carnival is the first line to operate year-round cruises from the southern port. 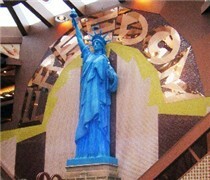 Launched in 1990, the ship received a multimillion-dollar Evolutions of Fun upgrade in late 2008. Check out our gleanings about the clientele, and features onboard the ship and ashore. Come along for 12 things we discovered! 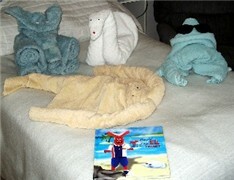 Carnival Cruise Lines recently published a second, 90-page edition of its popular towel animal book. “Carnival Towel Creations with Freddy” is brimming with instructions and photos for creating those wildly popular “towel animals” that Carnival’s guests find in their staterooms each evening. SouthernCruising.com ™ took Carnival’s challenge and assembled four creatures. Was it easy or hard? How long did it take? Do our animals look like those in the book? Come get the cuddly scoop! Carnival Freedom Inspection: Let the Fun Begin! The Carnival Freedom is one of the newest Fun Ships in the Carnival fleet. 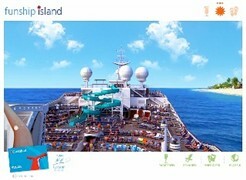 It boasts a 13,000-plus-square-foot spa complex, multiple pools, a robust Camp Carnival and other perks for cruisers. Freelance cruise writer Kay Harwell Fernandez was onboard for SouthernCruising.com (TM) to check out the ship. So come along as Kay details her perspective on the ship's public areas, accommodations, onboard activities, dining and itineraries. Carnival wants you to get into the feel of a cruise before your feet ever leave land. The contemporary line has rolled out "FunShipIsland.com," a new Web site that allows you to experience a cruise in many way and with your own personal style. We loved looking at the suites and staterooms, enjoyed our time in the casino, and had a ball "zooming" down the upper deck water slide. But we really thought it was a hoot when we went into the bar and the piano player sang a song for us with "our own name." Talk about high-tech at its best.